Thanks to Dr. Pepper, students are finding themselves hyped up and energetic, but that’s not because of the soft drink. Two School of Cinematic Arts students, Xavier Burgin and Katherine Duffy, were recently awarded tuition scholarships through the 2012 Dr. Pepper Tuition Giveaway for demonstrating within sixty seconds how they plan to change the world. Burgin, Production MFA ‘15, has been awarded a scholarship to help realize his goals as a filmmaker. Additionally, Burgin is among the Giveaway’s top ten finalists and is eligible to win the $100,000 grand prize at the Discover BCS National Championship Game. To vote for Burgin’s Project to go on to the final round, please visit http://www.drpeppertuition.com/entry/63 . Voting ends December 17th. Due to the rising costs of education, the Dr. Pepper Tuition Giveaway was founded to help offset some of these expenses by awarding hardworking students who are striving to make an impact in their community or the world. 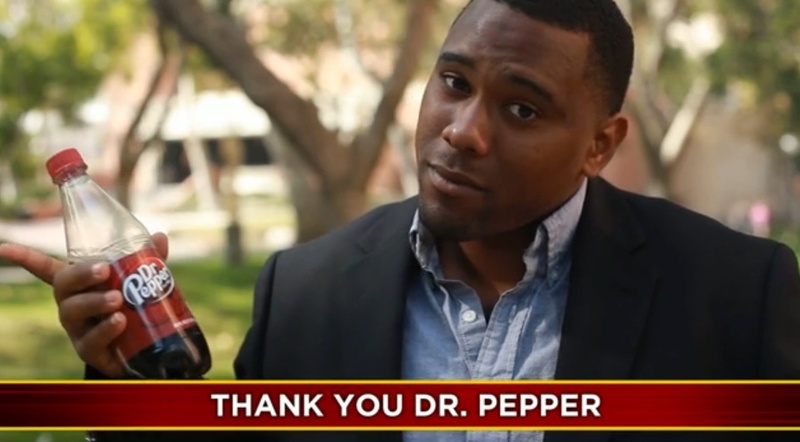 For years, Dr. Pepper has awarded millions of dollars in tuition to students across the country to help them pursue their varying interests and goals. By submitting a sixty-second video, students explain how they will make a positive difference for a chance to win tuition scholarships ranging from $2,500 to $100,000. Through their work, Burgin and Duffy found themselves amongst these winners. Undergrad Animation student Duffy has also been awarded a tuition scholarship for her video describing her aspirations to become an animator. Duffy previously won a scholarship for an animated short titled “Be a Friend” for Project Yellow Light to stop texting while driving. This project was later used as a Public Service Announcement for the Ad Council as part of the “Stop Texts Stop Wrecks” campaign.